Another room reveal! If you remember, I showed you my niece Grace's room reveal, here. 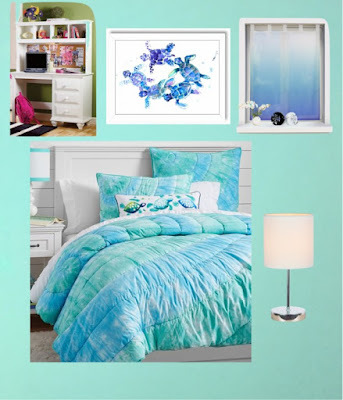 After I did her room my niece Amber decided that it sounded like a great birthday present and she wanted me to makeover her room for her 11th birthday! I love working on a girls bedroom! With Amber's room we were starting with a blank canvas as she was moving rooms in the house. She knew she wanted to paint her room with the same color as her old room which was Behr Marquee - Aloha. The left wall has the beginning of a gallery wall! What do you think? I love it and most importantly, she loves it! Now that Amber's room is finished, Mia, her sister has requested an Auntie Sandy room makeover for her 6th birthday! Her request is fashion/ballet. 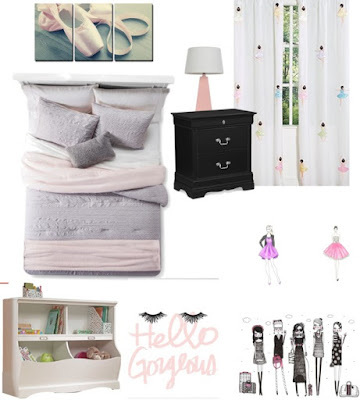 Even though she is only turning 6, she is very sophisticated :) Check out her mood boards! When it is all finished I will post the reveal! Hope everyone has a great day! Till next time! ***If an item is still available, I posted a link for it. Some are affiliate links, meaning if you make a purchase, I may receive a small commission. Thanks for supporting my blog! Can I help with your resolutions?